I am happy to announce that I have been selected as the artist for McKinney’s first public mural project. 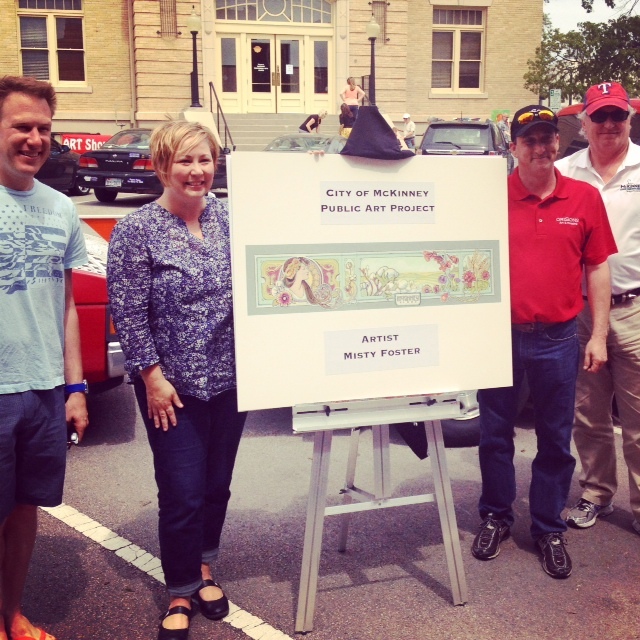 Today I was honored to be a part of the official unveiling of my design, during the Arts in Bloom event on the square. In addition to the City’s funding, there have been private donors that have also made the mural project in McKinney a reality, so a big “Thank You” is due to everyone who had the vision of bringing a public mural to their city. I’m grateful to have been chosen for the task, and know it will be a fantastic addition to downtown. I’ve been working on this project for a few months now. After submitting my application in December, I worked on a couple of rounds of designs in January and February. I was notified in March that my design was selected, and I’m waiting to get the go-ahead, once all the details gets cleared through City Council. For my concept, I went with an Art Nouveau-esque design, inspired by artists like Alphonse Mucha. The design includes cotton fields (a huge part of McKinney’s history), and native wildflowers that have each special symbolism that relate to the downtown area (paintbrush, trumpet vine, wine cup, blanket flower). The actual mural will be even more vibrant and full of detail. So where will this mural go? Glad you asked! The mural will be on an exterior wall of a downtown building (currently slated to go on the south wall of the Cadillac Pizza building). 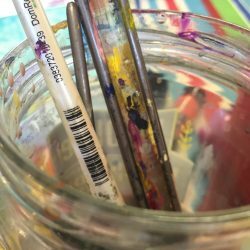 The finished painting will be 40 feet wide, and about 9 – 10 feet tall, and I estimate it will take 4-6 weeks. I plan on posting pics of my progress along the way, so stay tuned! 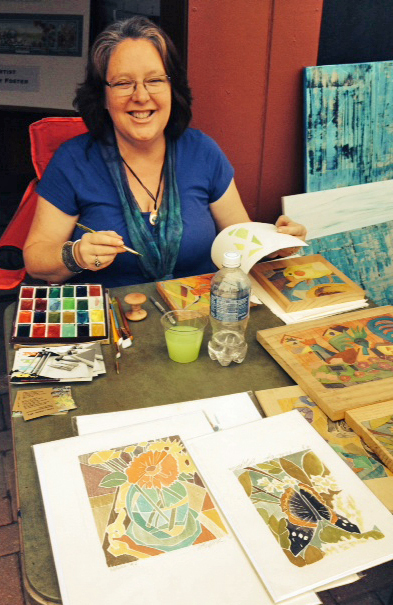 While I was there, I enjoyed seeing the other artists working live out on the square. I was excited to meet Lynne Hubner, a very talented and skilled printmaker. I had seen and admired her work before, and she currently has a great exhibit of her prints at the front of Orison’s gallery. She was super nice, and I was even able to pick her brain about some of her printmaking techniques. I’ve got my eye on a couple of her prints……. you can see her work at lynnehubnerprints.com. 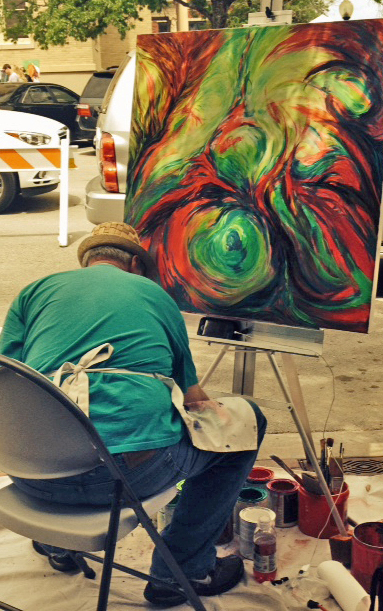 And I also had to stop and meet this artist, as I had watched his painting progress over a couple of hours. Being a fan of color, I was impressed with his use of complementary colors (green/red is a difficult combo to make look good, but he’s doing it! ), and his expressive use of line. He told me he has a Facebook page of his art, so I’ll need to check that out. Thanks for sharing day 12 with me!